- find out more about it here, which is the site for LowMan with the facial setup by Kate Attwooll, and here. The original LowMan used to be found @ Lichiman. 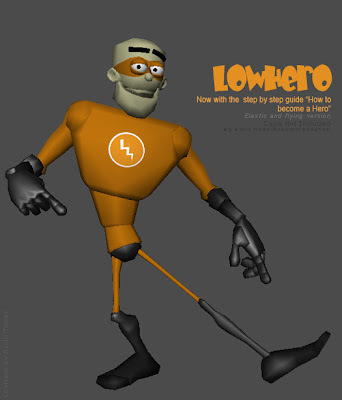 On that site you will also find tips on how to install LowMan, as well as a LowNinja by Dan Burgess and a script that mirrors any pose on LowMan. 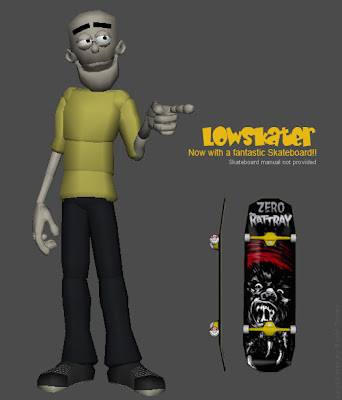 Animator Rodri Torres has two tweaked versions ready on his site, LowSkater and LowHero. No AB review yet. Even though it's a well built rig, I wouldn't recommend using it for demo reels, because the rig is associated with "student" level work. Do you have a rig you want to add to Animation Buffet? It can be an original rig, or a modification of an existing rig, add-ons for characters like wigs, props or a set for the character to interact with, etc. etc. Send me an email with the link to the file or page which hosts the file and a description of what it is. If it is your own file and you have no host, let me know and I can host it (this method is not preferred due to limited storage space). - Well, have you ever spent countless of hours trying to find free animation rigs? Would you prefer to spend that time animating? I know I do. There are many artists who offer their rigs for free online, or sites which list rigs that are currently available, but it's all spread out across the web and time consuming to find and to go through. You need a hub which combines all those lists. That's what I would like Animation Buffet to be. Are all these rigs free? - Not all. Most of them are, but when there's a price I'll mention it in the post. What software is needed for those rigs? - Mainly Maya for now. If links are broken, credits are missing, questions not answered in the F.A.Q., anything at all, please let me know so I can fix it. Use "Animation Buffet" as your subject line and write to animate (at) jeandenis.net.